Why Convert PDF to EPub? Though PDF is a widely used file format, it's not without flaws, especially when you watch the PDF file on your mobile devices and zooming in for better reading, your text will go outside of your screen. You have to scroll in order to read the entire text. In this case, converting PDF to ePub can make it better. For ePub is designed for reflowable content which allow it adjust properly to fit whatever size screen your eReader has, and with whatever font size you choose to read at. EPUB can optimize reading on ebook device. What's more, ePub is the only ebook format iTunes accepts. By converting PDF to ePub you can read your PDF on iPad, iPhone, iPod Touch, as well as other eBook Readers. Paid or Free PDF to EPub Converter, Which to Choose? Choosing a good PDF to ePub converter is not an easy job, since there are numerous similar products on the markets. Even paid product can not 100% guarantee the output quality, so it is not necessary the only choice. In fact, there are also available freewares that able to do great job on PDF to ePub, some are even better than the paids. Now, let's take a look at several PDF to ePub converters as below, from paid to free, and make comparison among them. You can drag and drop to add source file, and convert several PDF files to ePub in one time. There are two options for customizing the output, you can choose TXT or picture mode to convert the PDF pages to ePub. 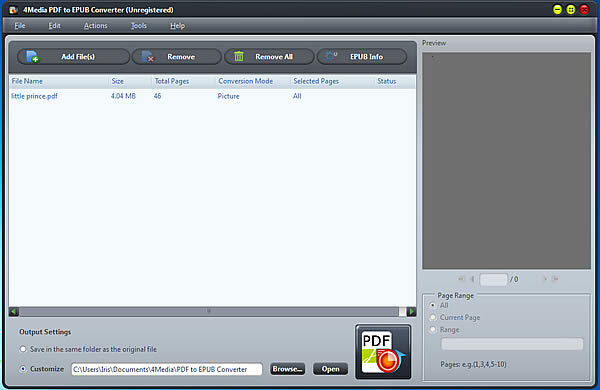 This paid PDF converter also allow users to specify which page to convert. Disadvantages: Does not keep the text formats of underline, centering, or even Bold. Sometimes misses content. Can't handle well with PDF that with 2 columns or above. If you insist on doing so, the output will join content from different column line by line, totally unreadable. As a paid software, it's lack of proper FAQ or support. Support converting encrypted PDF file. Allows users to customize output font scale, image DPI, etc. PDF bookmarks and catalogues are automatically converted into TOC of ePub with the original document structure, which is easy to browse and read. Automatically detects and identifies the paragraph, and keeps the content in the original logic. Disadvantages: The interface is not so pleasant for users, too small to see the button clearly and you can't resize the whole interface. The program is not so user-friendly, you need to take time to understand the buttons inside. $59.95 is such an expensive price for such converter that with so limited function. There is one feature that makes this tool different from others. It provides the user with PDF to ePub preset rules or to employ custom rules to the ePub conversion process. Applying a scripting language (.lua) to enable user to fully customise how text and images are extracted from the PDF files. Besides, it also allows setting DPI (resolution) for images and glyph (character images) with this tool. Disadvantages: Converting speed is not so fast compared with similar products, will take a little bit long for a 10MB PDF. The converted file can not be identified by device, will be marked as "Unknown Book" and "Unknown Author." Seems it is designed just for professional users, common users may encounter difficulty in customizing conversion. This 100% free PDF converter has a nice capability on outputting epub with well preserving format and layout from original PDF file. 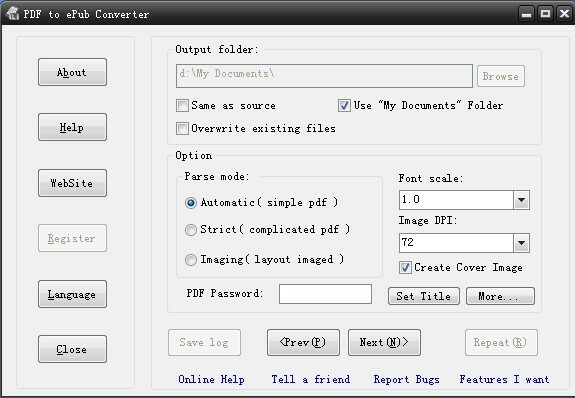 Like other PDF to ePub converter, it also supports batch conversion to convert unlimited files to ePub files. Moreover, it can handle well with multiple-column PDF which enables users to turn columns of content into logic and tidy paragraghs. There are two options for customizing output, you can choose to convert each page as an image to ePub or extract text and image from PDF to epub. The interface is very simple and easy to understand for every common users. Disadvantages:It works well as a freeware, however, more customization settings such as words space, book cover options, etc are needed to be added. For converting PDF to ePub, you may have lots of choices. But after reading comparison above, you will find that paid PDF converters are not always worth of its cost while freeware sometimes do better job than the paids. As for free PDF to ePub converter, PDFmate really does a great job. It is a 100% free PDF to ePub converter that can run perfect without licence, undesired plugin, but totally free of ad! Including ePub, it also supports converting PDF to Text, HTML, SWF and JPG. If you are searching a handy tool to take over PDF to ePub converting task for you, PDFmate Free PDF Converter can best fit this job. So why don't we get a freeware with better performance and best suits our needs?